BBQ’d Sea Bass with New Potatoes – AKA Exam Brain Food! With just 3 weeks to go until my 2nd year law exams, the only part of the day where I get to relax is when I’m cooking dinner. Really this is how the whole blog started. For me cooking is most definitely a form of relaxation, an escape, and today I am trying to calm myself down at the same time as cooking something that will hopefully give me the best possible chances in my exam. As promised, today I cooked some “brain food” – sea bass! Now…as students…I know we can’t usually afford sea bass! It’s a beautiful fish and as a result it can be a little pricey but don’t worry, if you’re on a budget and are in search of brain food I have some tips. For example, Asda’s in store fish monger offers a wide range of fish fillets for just £1. My favourite is their mackerel fillet with chili and garlic! In BBQ season they also do a trout stuffed with pea, mint and feta all for just £1! Another great tip is head to the supermarket later in the evenings and more specifically on Sundays. This is the best time to find expensive portions of fish in the reduced sections which is where I found this beautiful piece of sea bass. So once you’ve got the sea bass what are you going to do with it… here’s my suggestion. 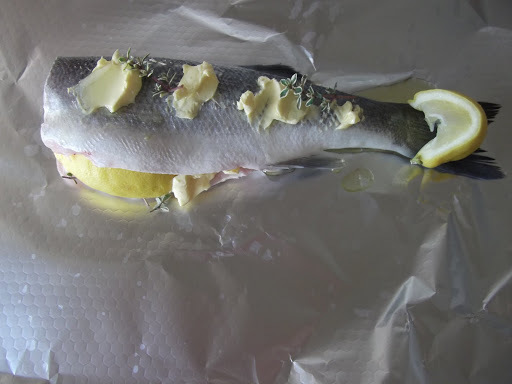 Stuff the cavity of the sea bass with 2 tbsp of the butter, sprigs of thyme and the lemon (cut into wedges). Spread the remaining butter on the outside of the fish and squeeze over any remaining wedges of. 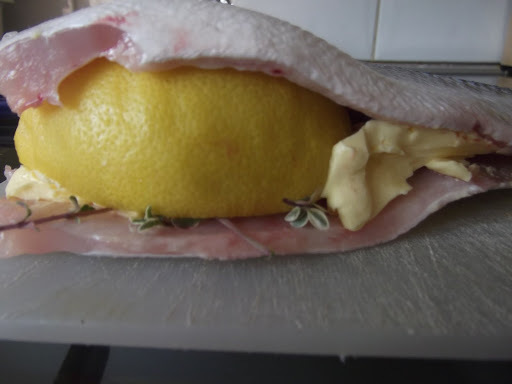 Pop a few more sprigs of time on, leave the half squeezed wedge by the tail and wrap up in a big tin foil parcel. For the new potatoes chop them in half, crush the cloves of garlic over them, drizzle on some olive oil and then sprinkle on top some finely chopped chives. Wrap these up in another bundle of foil and they're all ready for the BBQ! The Sea bass only takes 5-10 minutess, you don't want to overcook it! The potatoes on the other hand take between 20 and 30mins. Just give them a poke to check they're soft! 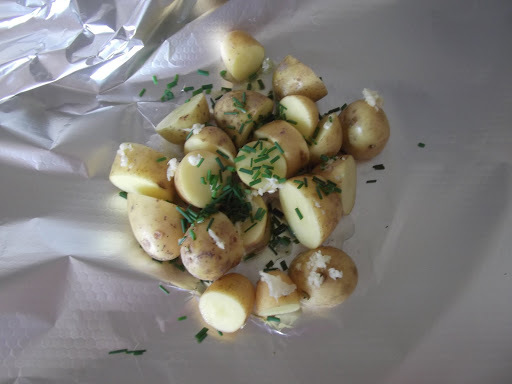 The potatoes are the most surprising thing I’ve ever BBQ’d as they are full of flavour and have a nice crispy outside almost like a mini roast potato! We served this with other BBQ’d veg such as corn on the cob, asparagus (which gets an AMAZING woody flavour on the BBQ), courgette and sweet peppers! Cous cous is equally nice to serve with BBQ’d fish especially such a succulent portion of sea bass like this! To all of those enjoying the early summer sun this sea bass recipe is a MUST! 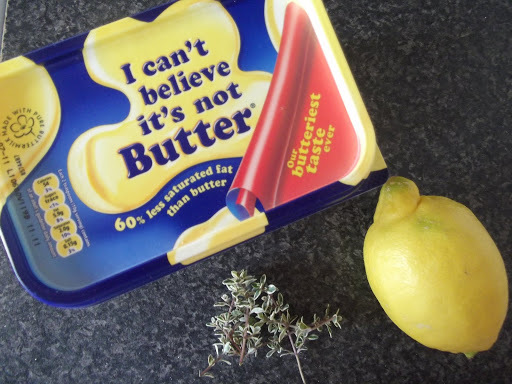 And for those students out there studying hard, do check out the ASDA fish fillets if this is out of your price range as they are brilliant to give you a boost before exams!